Raleigh, NC, is going for architecture. At least some times. (Endangering buildings such as the international-style offices at 419 and 425 North Boylan Avenue dull the shine a bit). Aiming for good architecture is excellent. It's also more unusual than it sounds. Think "though the Spirit may be willing, the Flesh is weak". A bit clearer: between politico lip-service, commitment and final action lie several abysses. 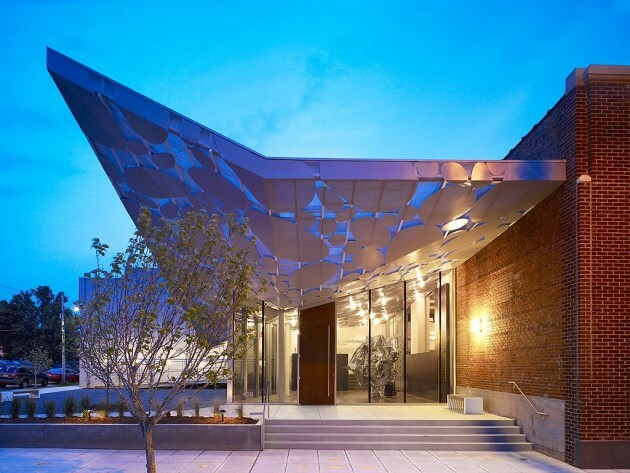 While architects and Raleigh's citizens are proud to watch Frank Harmon’s AIA-NC Center for Architecture and Design in Raleigh grow towards completion under much attention, a smaller gem has already opened earlier this year: The Contemporary Art Museum (CAM) of Raleigh. Local architects Clearscapes and LA-based Brooks + Scarpa got to work and re-adapted an existing warehouse CAM owns in Southwest Raleigh’s “Creative District” to become the museum’s main exhibition space. The new design encompasses 20,000 sf (1,900 sm) and features perforated screens on the entrance canopy, a signature Brooks + Scarpa element.